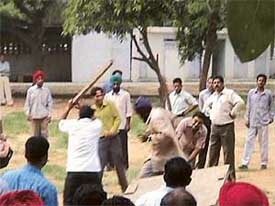 The Chandigarh Administration is running two separate rehabilitation policies. One for slum-dwellers and the other for people whose houses and land in the erstwhile villages had been acquired for building the city. 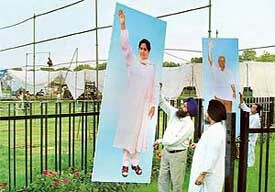 The Bahujan Samaj Party (BSP) has painted the town “blue” (colour of the BSP flag) ahead of the Uttar Pradesh Chief Minister, Ms Mayawati’s rally at the Parade Ground tomorrow to seek ouster of the Amarinder Singh government. Safety and security considerations of the public have driven the UT Administration to end its long-drawn battle with LPG distributors on the shifting out of their godowns from thickly populated areas to the periphery and work out an amicable solution. Mahima Choudhary had nothing to do with the confusion that marked the unveiling ceremony of Kinetic’s new machine — Zing at Hotel Mountview this afternoon. The actress had no idea that many among those present in the hotel were actually waiting for Karisma Kapoor who, they thought, was visiting as the brand ambassador for Kinetic Zing. One of the biggest anti-encroachment and slum clearance drives seen in the Union Territory of Chandigarh in recent years, has been called off. The drive initiated on the orders of the Administrator of Chandigarh, Justice O.P. 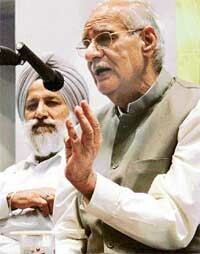 Verma, who is also the Governor of Punjab, has been halted following intervention by the Union Minister of State for Home, Mr I.D. Swami. The Haryana Urban Development Authority (HUDA) has launched a drive against misuse of residential premises for professional consultancy services. The first to be targeted by HUDA are the doctors running nursing homes in residential areas. Following an inquiry report, four IAS officials of the Punjab cadre and few other influential persons, who were wrongly made members of a cooperative housing society, will lose their membership, while rights of the original allottees will be restored, according to sources in the Chandigarh Administration here today. Responding to the wake-up call of the government for registering all sorts of wildlife possessions, the Forest and Wildlife Department, Chandigarh Administration, and a few local voluntary organisations are gearing up to spread awareness among people owning such items here. The Legal Affairs Committee of the Municipal Corporation today recommended formation of a three-member need-based committee for recruiting staff in the municipal bodies. The Commercial Tenant Association has called upon the city traders to boycott all government/administration functions in protest against the decision to implement the Rent Act notification. “A solution to the India-Pakistan problem lies in the creation of a people’s movement that will flow above and beyond the governments of the two nations. Governments are moving very slowly, if not dragging their feet, but the people are ready to reach out to each other with an enthusiasm that I have never seen before.” If there is anyone beaming with optimism about a final thawing of relations between India and Pakistan, it is Mr Kuldip Nayyar, a Rajya Sabha Member and veteran journalist. “General, you are now a prisoner of war.” The curt remark directed at the then military ruler of erstwhile East Pakistan, Lieut-Gen A.A.K. Niazi, in his plush office by the commander of the first Indian formation to march into Dhaka during the 1971 Indo-Pak war signalled the end of the 16-day conflict. Members of the War Decorated India (WDI), an association of gallantry award winners, have sought parity in allowances being paid by the Haryana government with those being paid by the neighbouring state of Punjab. IN the beginning of 90s, when the Command Hospital, (Western Command), shifted to its new building in Chandi Mandir from Chandigarh, it had only one super-speciality i.e. reconstructive surgery. 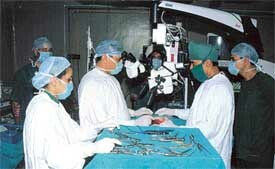 Spinal surgery being performed through neuro-surgery microscope at Command Hospital, Chandi Mandir. The Panchkula Industrial Association has threatened to launch an agitation against Haryana Urban Development Authority (HUDA) for its alleged “anti-industry” approach. Over two years since the launch of the “neighbourhood watch” scheme in the city, the Chandigarh police is yet to introduce it for enhanced security in Sector 41-D. The issue regarding the introduction of the scheme was recently raised by the MIG (Upper) Flats Residents Welfare Association, Sector 41-D, at a meeting with police officials. A section of taxi operators in the city today refused to accept an agreement between the Municipal Corporation and the taxi operators union over the reduction of the ground rent of taxi stands. The local unit of the Samajwadi Party has urged the UT Administrator to allow the use of Hindi and Punjabi for filling application forms to be submitted to various UT offices and departments. Traffic on the Phase I main road remained blocked for nearly one hour following an altercation and scuffle between a CTU bus driver and a car driver. The bus driver was allegedly beaten up by the car driver. Over 20 persons employed by Onicra Ltd — which claims to market credit cards of Standard Chartered Bank — gheraoed the office of the company in Sector 17, opposite Mehfil restaurant, this evening. They were protesting against the non-payment of their salary. The last rites of the 51-year-old Mandiv Sapra, Delhi-based Executive Director of Group 4 Securitas Guarding who was murdered by his doctor wife, were today performed at Delhi. The earth is called the Blue Planet because of the presence of water. However, this, now, has become a myth due to constant depletion of water resources. About 200 million people in our country are facing water crisis. Jaspal Singh, a resident of Gurdaspur, received head injuries in a clash between two groups on the premises of Shri Guru Ravi Dass Bhavan, Sector 20, here this evening. The clash occurred while interviews were being conducted for posts advertised by a Kuwait-based company, National Kharafi. Experts at the Government Examiner of Questioned Documents, a wing of the Central Forensic Science Laboratory (CFSL), have established that at least 25 answersheets of the CBSE examinations, sent for verification by the Chandigarh Police, had been tampered with by the beneficiaries. Some seats in the categories of foreign nationals, NRIs, NRI-sponsored and industry-sponsored candidates are likely to be available in BE courses in the University Institute of Engineering and Technology, Department of Chemical Engineering and Technology, as well as in some teaching departments, including the Department of Laws. The Vice-Chancellor of Panjab University today constituted a committee to look into the demand of M.Phil students that the entrance test for Ph.D be abolished. The committee, to be chaired by the Dean University Instruction, will meet tomorrow. The results of the entrance test for admission to Government College of Art, Sector 10 for the Bachelor of Fine Arts (BFA) course, has been declared. A merit list of 81 candidates in the UT pool and 64 candidates in the general pool has been drawn up. The results have also been displayed on the college premises. BENIN is located in Western Africa, bordering the North Atlantic Ocean, between Nigeria and Togo. Burkina, Faso and Niger lie to its north. Earlier called Dahomey, it gained independence from France in 1960, and its name was changed to Benin in 1975. Satinder Singh, alias Babu, a clerk with the UT Labour Court, who was arrested by the CBI in a corruption case involving two judicial officers, Jalandhar’s suspended District and Sessions Judge R.M. Gupta and UT Judicial Magistrate S.S. Bhardwaj, was remanded in judicial custody by a local court here today. It’s one wild ride you could be on. MTV has got 4000 km of road to be covered and just four bikes. For giving shape to its first adventure reality show, the channel is out in the North, hunting for just seven roadies, who exhibit tremendous skills in handling crisis situations. Out of the seven roadies the channel is looking for, there will be four boys and three girls. 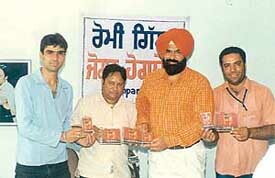 The fourth album of Romey Gill “Jogan Hogaye Ve”, was released by Mr Harcharan Singh Bhullar, SP, here today. The album, which has been marketed by T series, comprises eight songs. Music has been provided by Kiss n Tell. Mr Harcharan Singh Bhullar, SP, SAS Nagar, releases “Jogan Hogaye Ve”, an album by Romey Gill, on Monday. Infections like broncho pneumonia, tuberculosis and foot sepsis have been found to be the biggest cause of mortality amongst diabetics in North India. A study conducted by the Endocrinology Department at the PGI to assess the mortality rate amongst diabetics in North India, indicated that out of a total of 494 patients, 230 had died due various infections. The National Sports Talent Contest (NSTC) scheme initiated by the Sports Authority of India (SAI), which has been allotted to DAV Senior Secondary School, Sector 8, Chandigarh, in athletics and football disciplines, will conduct selection trials for trainees in the age group of eight to 14 years on January 8 and 9, 2004. Century Steel XI downed the Fateh Cricket Club by four wickets in the First IS Deol Memorial Cricket Tournament at the Cricket Stadium, Sector 16, here today. The Fateh Cricket Club team was all out for 66 runs in 18.4 overs. Rakesh Purang scored 14 runs, while Madan Lal claimed five wickets for nine runs and Dharamveer Yadav took three wickets for 10 runs. Income tax assessees would now have to apply at the Income Tax PAN Service Centres, and not to the assessing officers, to get permanent account numbers (PAN). The district administration has decided to take over at least two dispensaries constructed by the Haryana Urban Development Authority (HUDA) and run it through the District Red Cross Society. The IG has directed the DSP (East) to probe into the allegation of a Home Guard volunteer that he was bashed up by some persons who were travelling in a car near the Sector 24 Children Traffic Park on July 10.